In 1907, Picasso in a fury of creativity produced a nerve-shattering, grim, thoroughly unpleasant-yet spectacularly beautiful-image of humanity that would change art forever. 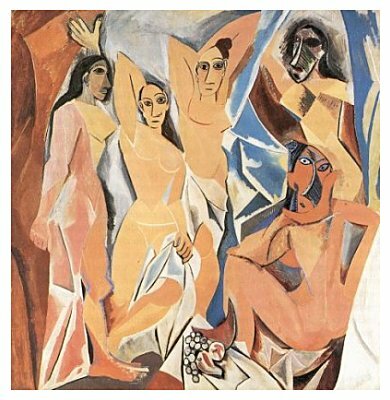 This world-shaking image was of cousre, his ragged, chaotic, inchoate, and possibly evil study of women that surrealist Max Jacob dubbed Les Demoiselles d'Avignon. The large painting is disturbing, abhorrent, repellent, and at the same time magnetic, unforgettable, and lyrical. Go see it because you'll hate it and love it all at the same time. 'It was a veritable cataclysm. I remember Shchukin, who really liked Picasso's painting arriving at my place in tears: "What a loss for French art!" The painting remained for years in the studio, its face to the wall. In 1937 it was finally revealed to the general public.